The latest book market statistics from Germany show that flat book sales are being generated by fewer overall book buyers. The Börsenverein calls for a focus on potential readers. “Book industry sales indeed remained stable over the last 15 years,” according to the report. In 2017, overall sales totaled €9.13 billion (US$10.7 billion), a slight decrease of 1.6 percent from 2016. But this relatively stable turnover came from fewer book buyers who are buying more books on average, the association says. A study conducted by market research firm GfK found that the number of book buyers in Germany dropped by 4.1 percent, from 30.8 million in 2016 to 29.6 million in 2017. Looking back five years to 2013, the numbers are even more dramatic, showing a drop of 17.8 percent, or 6.4 million people. However, the GfK study also showed that in 2017, book buyers in Germany purchased an annual average of 12.4 books. In 2016, the average was 11 books. While it’s good news that existing book buyers are purchasing more books each year, it’s a worrying trend that there are fewer of them. 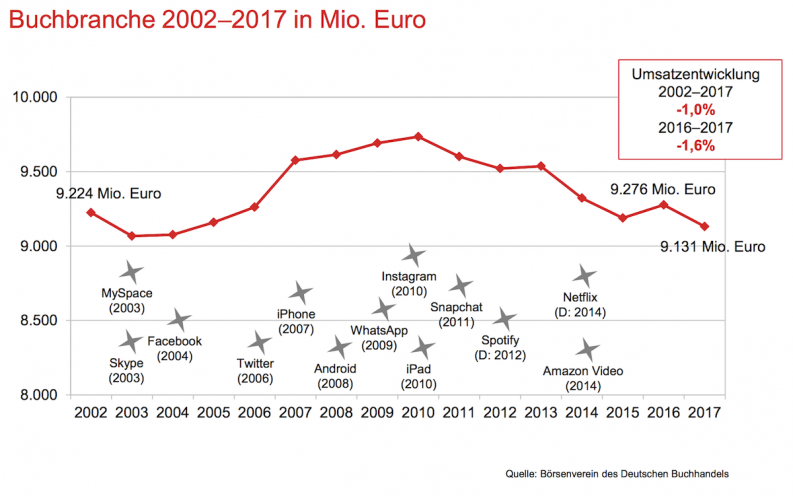 The Börsenverein cites competition from online entertainment as a major factor in the decreasing number of book buyers. 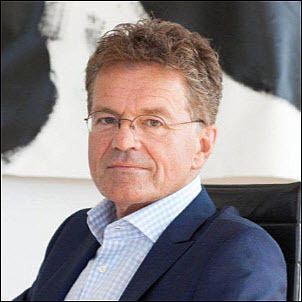 “In times of strong competition from other media, the book industry is working to grow and meet the needs of book buyers,” said Alexander Skipis, head of the Börsenverein. “Our surveys show that there are big chances to excite readers about books. 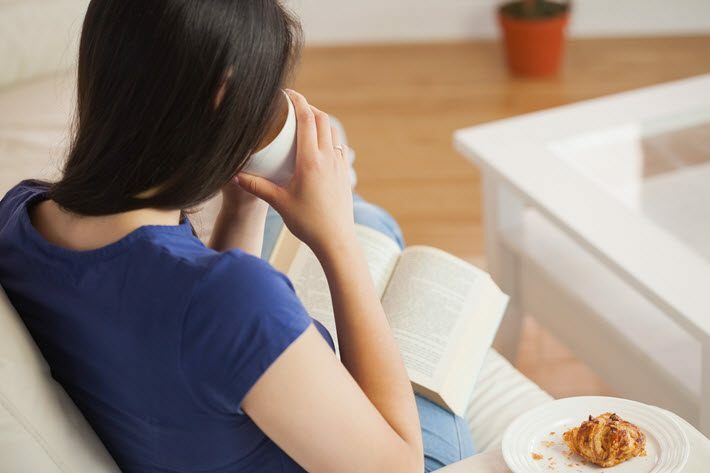 Even if they read fewer books today, those surveyed associate reading with positive feelings. Skipis also called for an industry-wide focus on bringing consumers back to books. 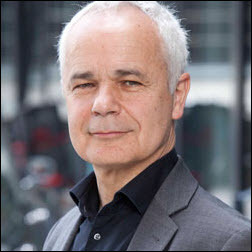 Heinrich Riethmüller, chairman of the Börsenverein, echoed this call to action, saying, “Book buyer development requires bookstores and publishers to change their thinking. “We have to focus more on the needs of potential readers. 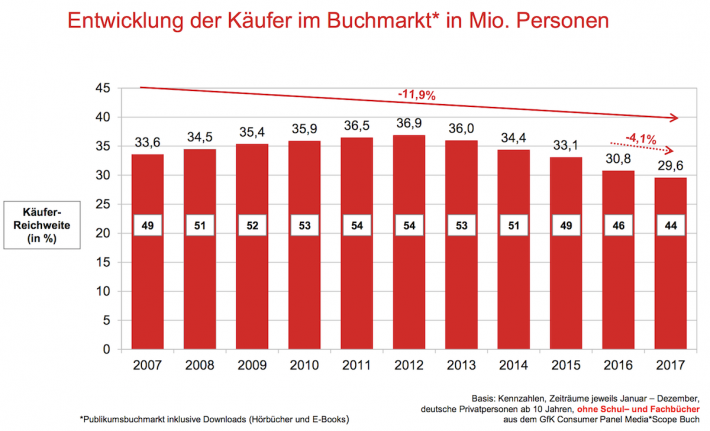 Following several years of growth, Germany’s ebook market leveled off in 2017 at 4.6 percent of overall book sales. In 2017, 3.5 million people bought an ebook, about 5.2 percent of Germany’s overall population. As in the overall book market, fewer customers purchased ebooks in 2017, but they purchased more books per person on average—8.3 books per person per year, an increase of 12.6 percent over 2016. This led to more units being sold in 2017, but because of a drop in ebook prices (5.1 percent) and customer preference for lower-priced ebooks, ebook revenue was down slightly in 2017 by 1.4 percent. Physical bookstores have retained a market share in Germany of 47.1 percent and remain the largest sales channel for books in the country. Revenue from this sector totaled €4.3 billion (US$5.1 billion) in 2017, down 2 percent from 2016. The second-largest sales channel for books is publishers selling directly to businesses, institutions, and others. Accounting for 21.3 percent of Germany’s book sales, revenue in this sector remained steady in 2017 at €1.94 billion (US$2.3 billion). Not surprisingly, sales through online bookstores rose in 2017 by 1.5 percent, becoming the third-largest book sales channel with 18.8 percent of the market. On a positive note for German publishers, translation rights sales from Germany to other countries rose by 7.7 percent in 2017. China was the leading purchaser of German translation rights with 1,261 licenses. The largest growth in overall rights sales came from travel, nonfiction, and education titles. Children’s books made up the largest segment of rights sold abroad—38.7 percent of the total. And Germany maintained its strong tradition of translating books from other languages in 2017. German publishers released 9,880 first-edition translations, amounting to 13.6 percent of the total title output for the year.